Yesterday, I shot about 200 rounds of various brands through it. Others at the range shot another 100. No malfunctions. Recoil with +P and +P+ was slightly more noticeable but still comfortable. Zero seems to be at about 30ft, so shots taken at 21ft were fractionally low. Dispersion at 21ft just over an inch, at 75ft just under 4″. The trigger is quite nice. It’s DAO of constant, fairly light weight of pull. Ejection is quite brisk, empties go 8-10ft. Same weight as Kahr PM9 and Keltec PF9, less than half felt recoil. Recoil and magazine spring also much lighter. One reason for the reliability is that the next round to feed is in position before the shot is even fired, while in a conventional pistol is has to rise before the slide returns from recoil. Since the feed angle is zero, the barrel required no feeding ramp and thus has full chamber support. The extra 1.5″ of barrel length is main advertised feature of this gun, but the low recoil, the extra round in the magazines vs. other pistols of the same size, and the great accuracy are also worth noting. 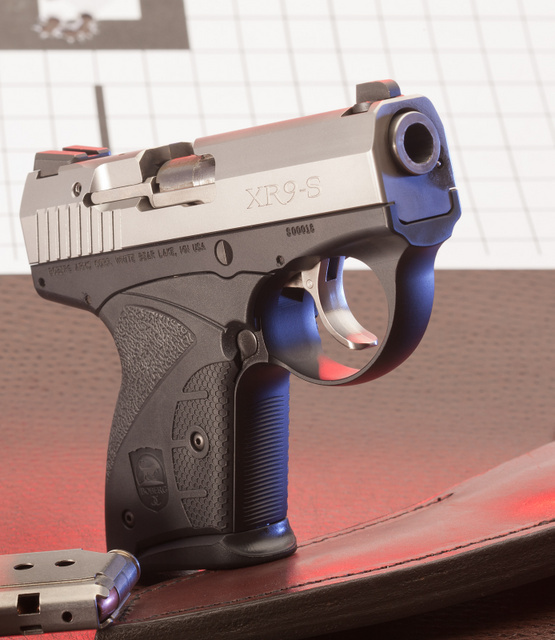 This entry was posted in pistol and tagged 9x19, boberg, subcompact, XR9-S. Bookmark the permalink. It sure is neat! I hope they make a long barreled version of it. It’d be cool to have a long barreled gun (6.5-6.8″?!) that can fit into an IPSC box. The issue I see with using this for competitive shooting is that the feeding mechanism precludes the use of a last-round hold open. Unless monsieur Boberg is fabulously clever and came up with something I cannot fathom, that is. What about a flag that pops up in front of the rear sight – a “chamber-empty indicator”? A slingshot reload won’t be as fast as a slide-lock speed reload. That’s okay; not every gun needs to be an IPSC game gun. I was with Oleg this session & tend to agree:this unusual pistol is a shooter! One female shooter commented on how well it fit her hand.All commented that felt recoil was noticeably less than with comparable 9mm’s. Loading the magazine & chambering the first round takes some getting used to:cartridges are inserted into the mag bullet-first which looks backward,& the slide must be firmly racked to chamber the first round-I & at least one other shooter had a minor problem with this:nothing that a little instruction & practice did not cure. The DAO trigger is very smooth & even;indeed one of if not the best factory triggers I’ve felt.Tolerances appear quite tight & overall finish is excellent. Oleg, I had sent you some premium 147 grain JHP from a couple of different manufacturers to try in the Boberg. From the report, then, they worked flawlessly I take it. They did. I shot up those and a bunch more from a friend’s Y2K stash. All worked. I would definitely be interested in wringing one of these out. 300 rounds is a good start. Keep going. 350. Add 50 WWB ball fired last weekend. I’m not usually a modern auto-loader guy, but I must admit to being intrigued. I think I have to try and handle one of these first opportunity I get…. Interesting looking gun. But $949? That is a Keltec PF9, an M&P 9 and a case of ammo. At that price, it will never be popular. That said, if someone wants to give me one to try out, I am available. It’s a pistol equivalent of BMW Z3 — not cheap but very nice anyway. I never really liked the idea of creating another 9mm pocket polymer clone like Kel-Tec, Ruger, Kahr, Sig, Cobra, Skyy, Taurus and now Beretta and competing with them in a price war. I’d like to see how long it goes without cleaning, and just lubing to carry levels a couple times occasionally, before you have issues. Please don’t clean anything at least until 1000 rounds. Does this gun extract the round from the magzine to the rear or did someone insert the round backwards for grins? That’s why it’s so much more powerful than its stablemates; there’s an extra inch or so of extra barrel stuffed in there. Thank you for the reply and the vid. Makes sense, question of course will be how relliable this is over thousands of rounds. The extra barrel length in a “shorter” gun is ingenious. Someone needs to let Masamune Shirow know one of his near concepts exists for real now. This is really cool. Any word on release date? We shipped our first batch 3 weeks ago and are sending out our next batch in a few weeks. Is it just me or is that cartridge in the magazine backwards? The pistol feeds by extracting rounds from the back of the magazine, just like a Vickers machine gun. That allows a longer barrel with a fully supported chamber.